Full casting has been confirmed for The Broons, a new stage play bringing Scotland’s most famous fictional family to theatres across the country in a World Premiere adaptation by Rob Drummond. And whit a braw a cast it is! The Broons will open at Perth Concert Hall before dates in across Scotland before wrapping up at Theatre Royal in Glasgow Monday 7-Saturday 12 November. The play will star Kern Falconer as Granpaw, Paul Rileyas Paw, Joyce Falconer as Maw, Tyler Colins as Hen,John Kielty as Joe, Laura Szalecki as Daphne, Kim Allan as Maggie, Euan Bennet as Horace, Kevin Lennon and Duncan Brown as The Twins, and Maureen Carr as the Bairn. The Glebe Street gang have featured in DC Thomson comic strips in the Sunday Post since 1936 and this production celebrates them in their 80th anniversary year. Award-winning Scottish playwright Rob Drummond brings the iconic characters Granpaw, Paw and Maw Broon, Hen and Joe, Daphne, Maggie, Horace, the Twins and the Bairn to life for a Scottish audience in a production filled with laughs, love and comic-strip visuals, all set to a Scottish soundtrack. This world first theatrical staging draws inspiration from the famous comic strip to bring you a brand new lively and fast paced tale. Can Maggie really, finally be getting married?! Return to Glebe Street, the But an' Ben, and of course the Kirk to find out! 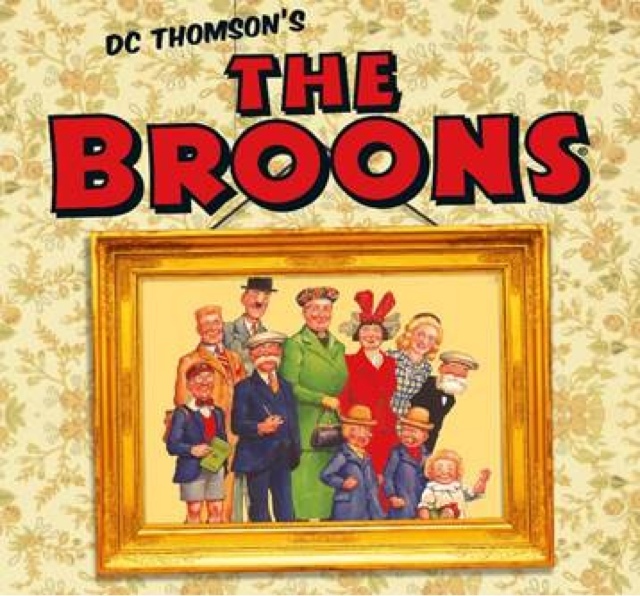 The marvellous artwork and well observed storylines ofThe Broons mean that everyone recognises a little of themselves in these classic tales and their much-loved characters, which will now be brought to life for a live theatre audience.